Enjoy the Sounds of Nature! Feel like you are in the woods far away from the noise from the cities. 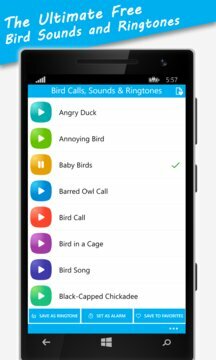 Get Bird Sounds & Ringtones app now for your Windows Phone or Tablet and listen to the best Bird's Sounds. This app is both fun and educational, because you can learn how to discern the sounds of each kind of bird. Set some of them as a ringtone, notification sound or alarm and you will never bother yourself with the irritating sounds you already have in your windows phone. The distinction between songs and calls is based upon complexity, length, and context. Songs are longer and more complex and are associated with courtship and mating, while calls tend to serve such functions as alarms or keeping members of a flock in contact. Most songs are emitted by male rather than female birds. Song is usually delivered from prominent perches, although some species may sing when flying. There is a more than 100 bird sounds. If you are more interested in songbirds, you can then always choose the one that fits you best such as kookaburra, skylark, blue jay and warbler. And of course, who can resist the beautiful singing birds such as nightingales, cardinals and sparrows. - DO NOT use these prank sounds on classes, at work or other inappropriate places and occasions. - DO NOT use it to harm somebody’s health. - DO NOT use it on your younger brothers or sisters. - Use this app to make fun with your friends. 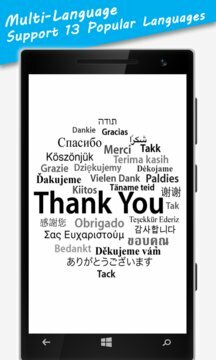 - Use the timer to play the sound at precise moment.